Do you need a bigger file? The file available on this site is 1024 x 793 px. To obtain an alternate file type or higher resolution copy, please contact the owning institution. 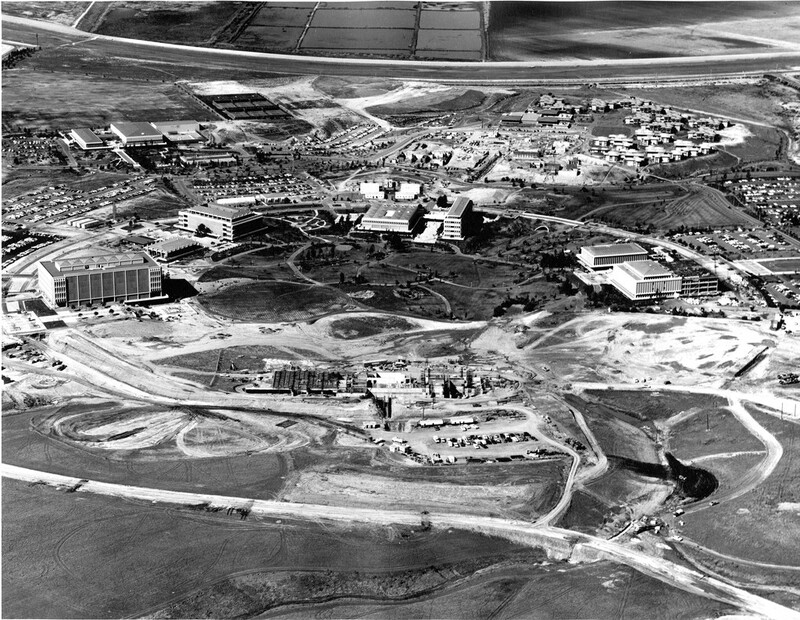 Scope/Content: UCI inner ring clockwise starting at six o'clock: Engineering buildings under construction, Physical Sciences opened in the fall of 1968, Science Lecture Hall (now Schneiderman Lecture Hall), Biological Sciences I (formerly Natural Sciences, now Steinhaus Hall), Fine Arts, Humanities-Social Sciences (now Krieger Hall), Commons (now Gateway Study Center) and Library-Administration (addition under construction, now Langson Library). Upper left to right: Crawford Hall (formerly Campus Hall), handball courts and swim pool, tennis courts, baseball diamond under construction, and far right Mesa Court single student residences and Mesa Court Commons. Original: 11x14" black-and-white photographic print.